The Big Apple has been beaten to death by big budget disaster flicks including No Escape From New York, The Day After Tomorrow and Armageddon. Dense populations and looming skyscrapers make major cities an ideal location for films bent on death and destruction. Disaster films are wonderful pieces of fiction; nevertheless, they underline an important truth — namely, major cities are in no way prepared to evacuate during a serious crisis. Of course, we didn’t need a big budget disaster movie to remind us that we are in no way prepared to cope with the debacles that have and will plague humanity. Hurricane Katrina was a horrific illustration of the hubris of man colliding with Mother Nature. In spite of Mr. Brown’s remarks, it became quickly apparent the day before the storm hit that evacuation orders were not going according to plan. The original plan was for people with cars to head north. People who lacked transportation would be picked up by buses, and were advised to have three days worth of supplies. As is the problem with most major cities, the highways became incredibly dense as people tried to evacuate. 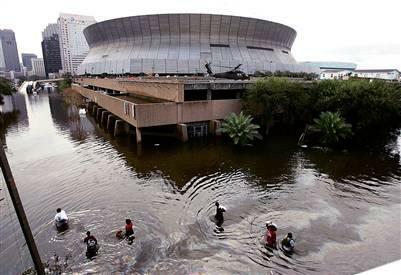 In an effort to speed up traffic, city officials decided that they would send people on the buses to the Superdome temporarily, which was closer to the storm. This last minute decision played a crucial role in the disaster that followed. Americans sat in disbelief in front of their television screens as they laid witness to the worst civil engineering disaster in United States history. People trapped inside houses fled to their roofs as water swallowed the city. The Superdome occupied center stage, which became overcrowded with thousands of people. The eyes of the nation were enthralled by what appeared to be a major disaster movie taking place in their own back yard. A major earthquake striking a large, unprepared city doesn’t just make a good plot for a disaster movie, but is becoming a manifest reality of fracking. Hydraulic fracking is a drilling process used to extrapolate gas from a well by injecting water, sand and chemicals into rock deep beneath the Earth. Oil and gas drilling has been moving closer to major cities in Texas over the years. The process wastes water in a region that is already experiencing a drought. Major cities in Texas, like Dallas, are usually devoid of seismic activity. Evidence suggests that waste water injection is the culprit behind the recent earthquakes in Texas. According to the U.S. Geological Survey, the Dallas area has succumbed to 40 small earthquakes in 2015 alone. In January, the city of Irving experienced 11 earthquakes within twenty-fours hours. The quakes are tied to drilling in the Barnett Shale, which sits beneath western Dallas counties and stores approximately 40 trillion cubic feet of natural gas. Major disasters can lay waste to cities from coast to coast, whether it be earthquakes in the west, tornadoes in the south or hurricanes in the east. Watching disasters unfold, both in movies and life, serves as a stark reminder that we too are dependent upon others and ought to prepare to protect ourselves and our families. It’s not a question of whether a disaster will strike a major city, but learning how to cope with a disaster whenever it does strike. We can reference the mistakes of past disasters to better prepare for the future. One way to stay clear of a disaster is to live outside city limits, and to be stocked with emergency supplies. 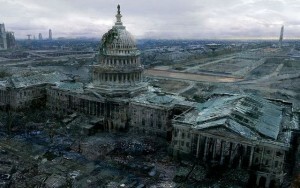 From the comfort of your home, you can watch the disaster unfold both onscreen and off.